ReelPRO V2 from Supply55 is an affordable, easy to install, easy to use universal take-up system allowing users to improve efficiency and profitability when printing longer jobs, such as vehicle wraps, banners, wallpaper, and signs. ReelPRO V2 is compatible with all wide format printers and laminators allowing shops to incorporate the system easily into their workflow and use it throughout their shop on multiple devices. This universal take-up system allows the user to operate their printer unattended resulting in improved profitability. ReelPRO V2 improves quality by eliminating kinking and scratching of prints as they are moved from the printer to work tables or as they hit the floor. The universal take-up system automatically shuts down when running in “manual mode” at the end of the print job. 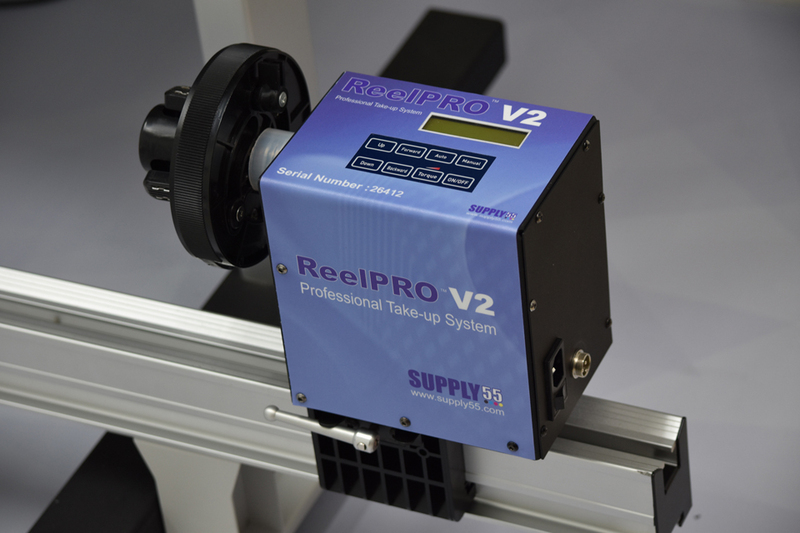 ReelPRO V2 includes a sensor to monitor print head movement when running in “automatic mode” and shuts down when the print head stops. It delivers true roll-to-roll production capability and supports media rolls weighing up to 110 pounds. Additional information is available on the Supply55 Web site at www.supply55.com or by calling Supply55 at (734) 668-0755.